From 2nd February to the 10th of February this year, Mumbai comes together to celebrate the Kala Ghoda Arts Festival. The first edition of the festival took place in 1999, and since then “Kala Ghoda” has achieved a cult following among the connoisseurs (and non- connoisseurs) of the various forms of art it showcases. Kala Ghoda is where you get to see and experience hitherto uncelebrated talent. This year Kala Ghoda had its usual mix of interesting inputs from the spheres of theatre, dance, music and food. With the help of the local talent, the workshops created quite a buzz. The most attractive factor of Kala Ghoda for the layman remains- the street exhibit. What is so great about Kala Ghoda? Well, it’s the setting- the fact that it is conducted bang in the middle of the older parts of Mumbai. It’s the artifacts which are showcased and put up for sale- at a cheaper price than otherwise. It’s the platform which the artists get to exhibit their talent. And. it is the unanimous feeling of awe, at the talent which exists and thrives amongst us. The street exhibit had a large variety of exclusive products- like silk sarees, decorative items, household items, stationery, cloth, etc. Some of the outlets which really caught my eye were- Shor Sharaba ( An outfit which sells designer products online), Item Number (which does some great Bollywood inspired designs) and Neil Dantas (who makes socially aware t shirts). The installations at Kala Ghoda were very relevant to today’s time of social upheaval- they spoke about women’s rights and about corruption in a way that made the viewer dwell on them. The food options were average, but provided a great relief to the crowd- which mostly consists of college students. 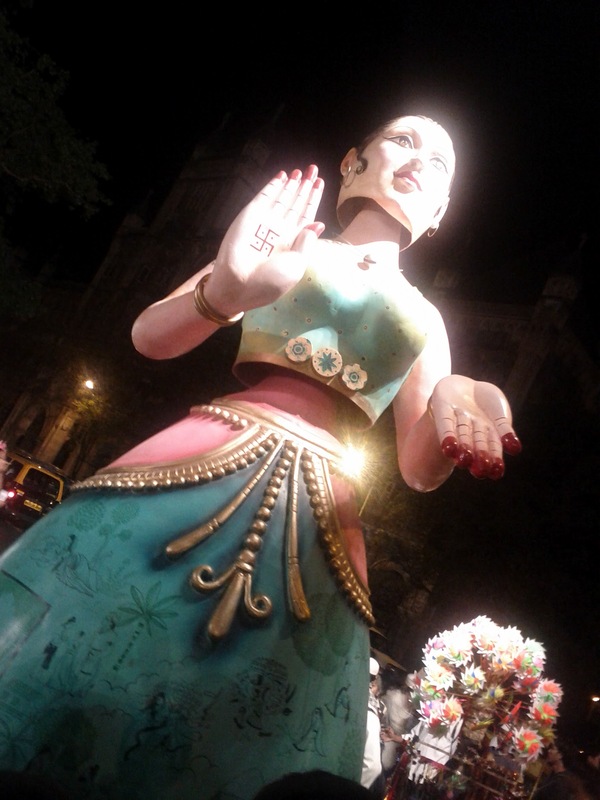 But if you haven’t been to Kala Ghoda, you absolutely must take out the time to pay this gigantic festival a visit. Even if you have been here before, you should come again- because they always have something new to offer.